For more details on the kings of the East Angles, including the Wuffingas, see List of monarchs of East Anglia. 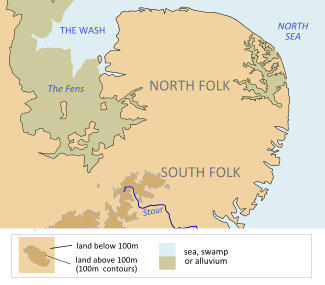 The kingdom of East Anglia was settled by peoples from northern Europe during the 5th and 6th centuries. 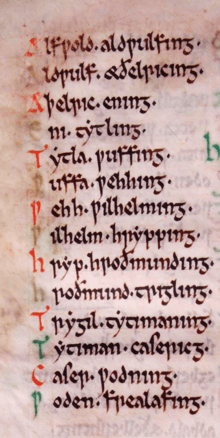 Historical sources relating to the genealogy of the East Anglian kings include the Anglo-Saxon Chronicle and Bede's Ecclesiastical History, both compiled many years after the kingdom was formed, as well as lists produced by medieval historians, such as the 12th century Textus Roffensis, who may have had access to other sources that are now lost. Several of the Wuffingas kings are included in a pedigree of Ælfwald, contained in the Anglian collection that dates from the 9th century. In the pedigree, Ælfwald is claimed to descend from the god Wōden. ↑ Osbert Guy Stanhope Crawford (1948). "Sutton Hoo and Beowulf" by Sune Lindqvist in Antiquity, Volume 42, Page 140. Antiquity Publications. Retrieved 30 November 2012. ↑ Colin Chase; University of Toronto. Centre for Medieval Studies, p. 6 (1997). The Dating of Beowulf. University of Toronto Press. pp. 7–. ISBN 978-0-8020-7879-7. Retrieved 30 November 2012.